Calling an employee a contractor feels like an innocent enough move, especially when your business is running on thin margins and doing so could save you bundles in taxes. But a misclassification of an employee as a contractor can cost you in the long run. It’s easy to see the incentive: Employers have to pay taxes, government benefits, corporate benefits and potentially overtime pay for employees, but they are not responsible for these costs for contract, or freelance, workers. But if an employer has been incorrectly classifying employees as contractors -- and therefore skipping out on requisite taxes -- and the truth comes back to roost, the impending tax bill can be backbreaking. That’s why its important to know the difference, legally, between an employee and a contractor. 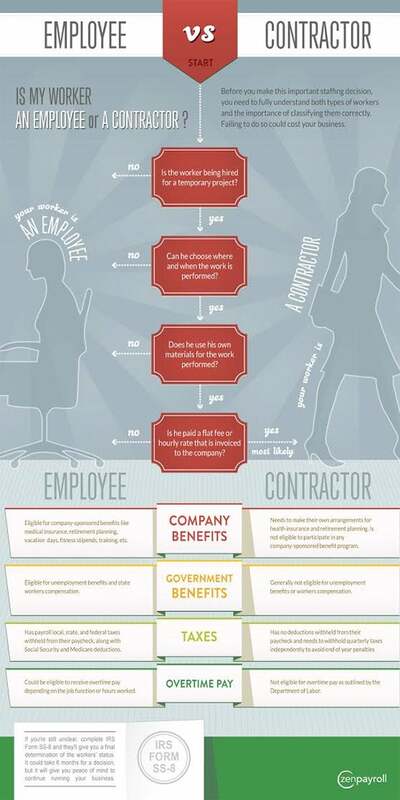 The infographic, embedded below, created by payroll software company ZenPayroll, provides a flowchart to walk you through determining whether you need to be classifying a worker as an employee or a contractor.